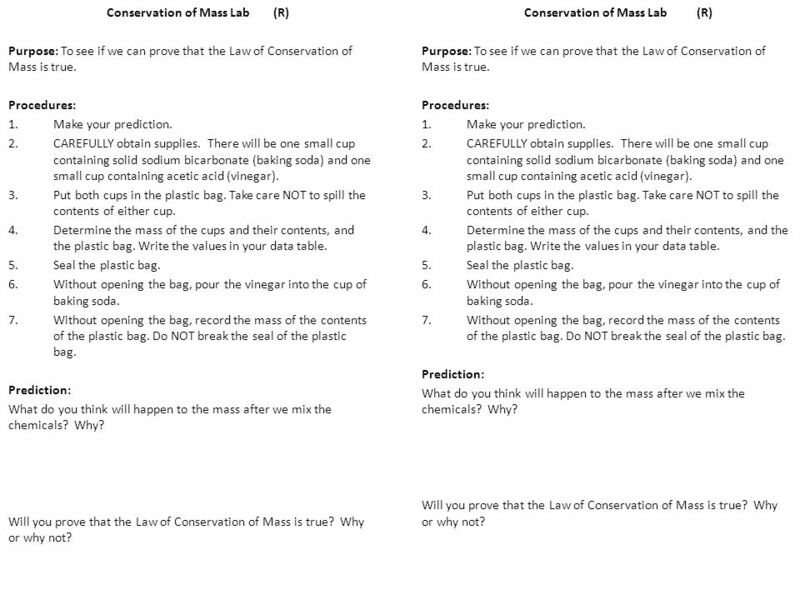 Purpose: To see if we can prove that the Law of Conservation of Mass is true. Procedures: Make your prediction. CAREFULLY obtain supplies. There will be one small cup containing solid sodium bicarbonate (baking soda) and one small cup containing acetic acid (vinegar). Put both cups in the plastic bag. Take care NOT to spill the contents of either cup. Determine the mass of the cups and their contents, and the plastic bag. Write the values in your data table. Seal the plastic bag. Without opening the bag, pour the vinegar into the cup of baking soda. Without opening the bag, record the mass of the contents of the plastic bag. Do NOT break the seal of the plastic bag. Prediction: What do you think will happen to the mass after we mix the chemicals? Why? Will you prove that the Law of Conservation of Mass is true? Why or why not? Conservation of Mass Lab (R) Purpose: To see if we can prove that the Law of Conservation of Mass is true. Procedures: Make your prediction. CAREFULLY obtain supplies. There will be one small cup containing solid sodium bicarbonate (baking soda) and one small cup containing acetic acid (vinegar). Put both cups in the plastic bag. Take care NOT to spill the contents of either cup. Determine the mass of the cups and their contents, and the plastic bag. Write the values in your data table. Seal the plastic bag. Without opening the bag, pour the vinegar into the cup of baking soda. Without opening the bag, record the mass of the contents of the plastic bag. Do NOT break the seal of the plastic bag. Prediction: What do you think will happen to the mass after we mix the chemicals? Why? Will you prove that the Law of Conservation of Mass is true? Why or why not? 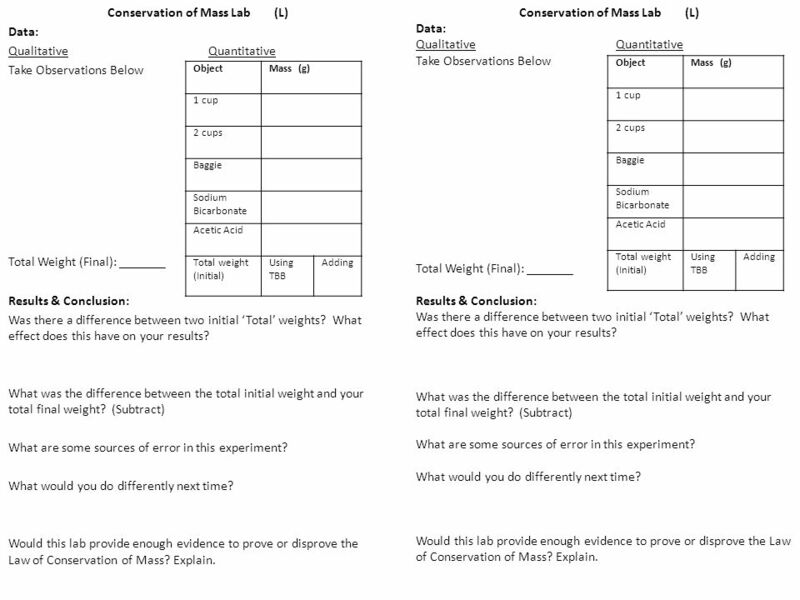 Download ppt "Conservation of Mass Lab (R) Conservation of Mass Lab (R)"
In Search of Active Ingredients- Chemical and Physical Changes. Foundations of Physical Science Workshop: Periodic Table Tiles. Lab Skills Focus: Filtration magnesium + sodium sulfate carbonate carbonate sulfate Chemical Equation MgSO 4 + Na 2 CO 3 MgCO 3 (s) + Na 2 SO 4 Word. In today’s STEM Lab You will be a Chemical Engineer We are Chemists at work mixing it up! Chemical Reactions Review Game. Rules Lab Table Teams 1-6 One representative from each lab table will come to a buzzer to receive a question on the board. Conservation of Matter. Chemical Reactions Happen all of the time Happen naturally or can be man made Can be physical or chemical PHYSICAL CHEMICAL. Catalyst – September 2(11), Label the following as either a pure substance (PS) mixture (M): a) Salt water b) Hydrogen c) Salad 2. Dr. Spock performed. States of Matter Slime. Eureka! States of Matter: Liquids. Note: You have a 100 point summative tomorrow. Study your notes! Early Work: March 2nd 1.Please grab a computer and go to my school district website. 2.Take out your hypothesis, procedure, and data from the vinegar and. Tuesday, September 25th.  Chemical change vs. Physical Change  Physical change = just changes form  Chemical change = something new is made  Evidence. Fizzy Balloons Investigating gases! Chemical Sciences Year 5. Chemistry in a Ziploc Bag: Mini-lesson Vanderbilt Student Volunteers for Science Spring 2014. Investigation 11A Stoichiometry. 2 Investigation 11A: Stoichiometry If your doctor did not tell you how much of a medication you need to take, you could. Lab Activity #4: Quantitative Analysis Chemical Background – Vinegar is a solution of water that contains acetic acid (CH 3 COOH). Baking soda is pure. First Law of Chem How to do Lab Write-up 1. Word Processor - Computer that will run: a. Word b. Open Office (click on blue dot to download for FREE ) This.